Today I finished meeting with my last science fair team of students, and I’ve gotta say that I’m pumped about their ideas for experiments this year! It’s definitely the most creative and interesting bunch of experimental questions I’ve ever seen from 5th grade students. But it wasn’t always this way… after running a 5th grade science fair for the past 8 years, my ideas of how to guide students through this challenging endeavor have evolved quite a bit. Nowhere has this evolution been more apparent to me than this first critical phase of the science fair: choosing what to do for an experiment. For one, I don’t use the word “project” with my students… ever. Any science fair “project” worth its salt is an experiment, and the word “project” makes it sound like anything will do as long as it takes a lot of time and effort… Build a realistic baking soda volcano? Create a scale model toothpick Eiffel Tower? Not in my science fair! I want to make clear from the get-go that these projects won’t do, that our science fair is about doing an experiment. Killing creativity: There’s a plethora of resources out there on the web and in print aimed to help students choose a science fair “project”. I know I’ve been tempted in the past by Science BuddiesTopic Selection Wizard… “Answer a short survey and the Topic Selection Wizard will find you the perfect project!” What could go wrong?? Actually a lot. As soon as students start looking at lists of pre-made experiments their brains kill the creative juices of curiosity and instead begin an analytical process of finding the “perfect project”. If students are confronted by some confusing vocabulary they are unfamiliar with (bacteria? refraction? air resistance? ), they simply ignore that experiment and look for another. This process of elimination and path of least resistance will naturally drive most students to the same boring and undeveloped ideas that all science teachers will recognize: how do different drinks affect the growth of plants, etc, etc. Ending inquiry: As I wrote about in my last post, one of the saving graces of the science fair is the opportunity for students to engage in more open and less structured inquiry learning. Even the first time I ran a science fair I know I stressed how important it was to have students choose an experiment that was interesting to them. But I kept ending up with student’s doing experiments that sounded like they would be more interesting to their parents. How did this happen? For one, 5th grade students don’t really know enough about the different fields of science out there to know what interests they might have. Maybe they’re interested in sports or music or video games, but they can’t connect these interests to science, so they get frustrated and just cave in to the advice of their “helpful” parent. Students’ views of science (and their parents’ views) are usually extremely narrow, so the chance for true inquiry often gets shut down because of this disconnect between their interests and what they view as an “acceptable” science experiment. Dead-ending development: Even if you can get students past the lame lists of pre-made projects and the pressure of their parents, 5th grade students can’t be expected to come up with a developed idea for a scientific experiment if they lack the background knowledge about the topic. And they almost always lack the background knowledge! I was talking to a group today that wanted to do an experiment with water evaporation, but they didn’t actually know much more about evaporation than “the water goes up to make clouds”. How can I expect them to choose an interesting manipulated variable for their experiment, if they don’t know the basics of what makes evaporation happen in the first place? If I don’t give them enough time to figure this out and develop their idea, what happens is they’ll cling to the first idea they can think of, no matter how simple or doomed for failure. Rushing this phase of a science fair will stunt the growth of students’ learning big time. Brainstorm in baby steps: To begin our fair, students do a science interest survey to find out what fields of science appeal to them. In a lot of cases they may have never even heard of some of these areas of science, or realized that science was deeply connected to sports, engineering, and health. The survey helps students connect things they like to do with scientific fields or topics of study. Only then do students begin brainstorming experiments. Coaching is key: Just because I’m wary of parent involvement at this point, doesn’t man I think this is a laissez-faire phase. In fact, I would say that my learning how to better coach students to develop their experiment ideas is the single greatest factor that has improved the science fairs I’ve done over the years (although I have no data to back this up!). Using the experimental question scaffold above, it’s very easy to take questions in this format and improve them, simply by challenging students do think of other possibilities for the first blank (the manipulated variable) or to get more specific about the second blank (the responding variable). Even the famous “different drinks on plants” can be coached into scientific legitimacy with this string of probing questions: Why do you think different drinks will affect plants? These drinks have lots of different ingredients, so which ones are the ingredients that you think will affect them? Do you know that gardeners use fertilizers with certain ingredients to help plant growth too? What ingredients do these fertilizers have? What about investigating some of these ingredients in drinks and fertilizers to see which help a plant grow the most? You get the idea! Take your time: Very often my students will lack the background knowledge to choose an interesting manipulated variable that will yield understandable results… and that’s OK. I let them leave that part of the question blank, or keep it as a list of the possible manipulated variables they’ve brainstormed. The next phase of the science fair is researching their topic, so I give them some pointed research questions (there’s that coaching again!) that will enable them to help figure out a manipulated variable. By giving the students the opportunity to “let it ride” and learn more about their topic, you open the doors to many kinds of experiments that students might run from if pressured to craft a perfect question too early. This year I’ve got groups of students investigating refraction, car lubricants, memory, earthquake building design, weed killers… they know basically nothing about these topics right now, but they are interested as heck in them! So their questions just look like this for a while: “Does ______ affect how well a person can remember numbers?” “Does _____ affect how much light bends?” “Does _____ affect how well a building survives an earthquake?” Once they’ve done a little research they’ll be able to fill in the blank themselves, and they’ll end up with a much richer experiment in the long run. Next week the students will dive into the research, and I’m looking forward to seeing how their thinking and questions develop. Then of course it’s off to the next big thing: designing their experiment and writing a procedure… so stay tuned! 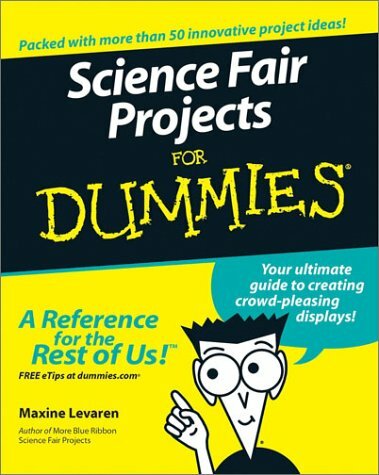 Saving the science fair: why bother? The discussion about educational value from my previous post has me thinking like a teacher-economist lately, analyzing the cost benefit of all the kinds of choices teachers have to make every day. One of the most important choices we make is what to include (and exclude) in the curriculum (although the amount of choice teachers have in this matter varies greatly depending on the school system!). Since today I held a kick-off event for our 5th grade science fair, I’d like to put that classic bastion of science education on the chopping block, and explain why, for all its flaws, I think it should be saved. Conflict with the standards-based shift: Since students in a traditional science fair have the choice to pursue all different kinds of experiments, doing the science fair as a unit doesn’t check off any content from your standards. And in our age of bloated science standards, we barely have enough time as it is to “cover” everything, so how can time be wasted on something devoid of content? Competition gets ugly : The student’s main goal in the classic science fair is to win, and often there’s a big deal made of the winners: ribbons, trophies, going on to regionals, etc. With that kind of competition, the pressure to succeed is high, causing stress for students and causing some parents to become way too involved in their “child’s” project. Same experiments every year: I’m willing to bet money that if I went back in time and attended a 1950’s science fair the experiments would be nearly identical to the experiments kids come up with today. Why so uncreative? Because conducting original research is hard for students who have been told what to do year after year. So they turn to books and websites for guidance and end up shopping around for something to do from the same tired list of experiments. Open-ended inquiry opportunity: You can’t pick up a current book on science education without being bombarded with the word “inquiry”. And yet, for all the talk about inquiry, from what I can tell, the amount of actual inquiry taking place in science classrooms today is pretty small. When inquiry does occur in the classroom, it’s almost always on the “guided” or “structure” end of the spectrum. Truly open-ended inquiry is a scary prospect for most teachers- because God knows what the students will do! How will I plan my lessons every day? What does a lesson even look like with open-ended inquiry? This is one of the saving graces of the science fair: in their ideal form, science fairs are meant to be open-ended, a chance for students to decide to investigate something that they are curious about, and figure out how to do it. Of cours it takes work to avoid the temptations of http://www.LameScienceFairProjects.com, but with the right amount of support and emphasis on creativity, student can come up with something better than moldy bread. As long as the teacher makes sure to stay true to the ideal of student choice and originality, science fairs can be the perfect piece of open-ended inquiry that’s missing from so many current curricula. Scientific skills, the long lost standard: If your science standards document is like mine used to be, you will find at the end of it something like a “scientific inquiry skills” standard, along with a few generalities about drawing conclusions and thinking critically. One unfortunate side-effect of the standards-based movement was a hyper focus on content knowledge, to the detriment of skills. As I discussed earlier, scientific skills are in some ways more important than factual content. When my students are 40 they may not remember that carbon dioxide insulates the earth by trapping radiated heat, but if they can weigh the evidence presented in a scientific piece of journalism and draw a reasonable conclusion, I’m a happy teacher. This is another plus for science fairs, they offer teachers and students a chance to focus on these often-ignored skills. Even if everyone in your class is experimenting with different content, the scientific skills will be the same. So a science fair allows us the freedom to actually put content aside for the moment and emphasize skills. Collaboration, not competition: Science fairs don’t have to become an ugly my-kid-is-smarter-than-yours fest. There are many ways to save the science fair from this terrible fate by emphasizing collaboration instead of competition. Have students work in teams instead of on their own. Have teams create a website for their project, so others can collaborate virtually like high school student mentors, or even students from another school. If you do things like this, your student’s experience will be a lot more like real scientific research, and they will learn more of the kinds of collaborative skills they will need in the future. This post is hopefully the first of many as I navigate the waters of what will be now my 8th science fair as a teacher. Along the way I’ve learned a lot about the opportunities and pitfalls of doing a science fair, but I’m always eager to learn more. 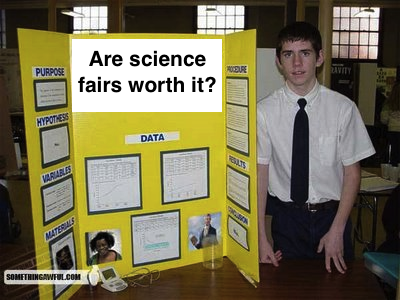 If you have experience with science fairs- bad or good, please join in the discussion, I’d love to hear from you! This is not a joke. Today in the faculty room I discovered the secret to science teaching success. There on the front page of The International Educator’s monthly newspaper was an article celebrating a school presentation of a science show called Brainiac Live! In the presentation (which is based on a British television show) a guy who goes by the name Dr. Bunhead (not a joke either) lights his head on fire to inspire students about the wonders of science. So there you have it- being a great science teacher is simple. All you need to do is blow things up, create giant ballons, shoot lightning bolts out of your fingertips, but most importantly- light your head on fire! Science shows like these are intended to get students excited about science, right? And there’s no question that they’re exciting- who doesn’t want to watch Dr. Bunhead nearly sear his scalp?? But what exactly are the students getting excited about? As teachers we would hope they’re getting excited about scientific ideas, scientific thinking, in short- excited about learning more science. But that’s not the case- instead students are only focused on the awesome scientific phenomenon in front of them (in this case Bunhead’s flaming head). They’re excited about the explosions, the noise, the surprising result, but not about the scientific explanation that usually comes afterwards. Using a show like this to inspire your students in science is kind of like coaching your high school basketball team by showing them the NBA slam dunk contest. Are they going to be excited? Sure! Inspired? You bet- they can’t wait to start practice the next day and spend an hour on… dribbling drills. NOT! In fact it could be argued that this approach to coaching or teaching could even be detrimental- because kids will come to expect the flash-boom-bang and never develop an appreciation for the less obvious excitements that take place inside one’s own head (as opposed to in a fiery ball above it). Example: Last week my 4th grade students were super pumped when they discovered by themselves how to create an electromagnet with a set of materials I gave them without further instruction. The fact that their simple electromagnets were so weak they could only lift up a few metal washers did not dampen their excitement one bit- because it wasn’t the phenomenon they were focused on, but the idea they had come up with. Imagine if instead I had started the lesson with a wow me demonstration of electromagnets- say lifting up a car with a giant electromagnetic crane and letting it come crashing down when I turned it off, and then follow that up with some lecture or reading about electromagnets or even a hands-on activity building a smaller model of the one I demonstrated. What would students remember a week later? Of course they could all recall in detail how Mr. Mitchell totaled a car, but very few of them would remember much of anything about the scientific explanation afterwards, or the version they made that paled in comparison. They’d be stuck on the awesome phenomenon, and the idea behind it would be merely a forgotten afterthought. So go ahead and enjoy Dr. Bunhead’s pyrotechnics, just don’t expect this approach to inspire the next generation of scientists, or expect it to work well in the classroom. Students (and adults) are already amazed by fiery explosions, and a bunch of wow me science demonstrations are going to result in excitement about more fiery explosions, but not kindle much learning. Our real challenge as teachers is to figure out how to get students amazed by their own observations, their own thinking, to spark that fire in their mind- not on their head. After splurging on Christmas gifts for the family, I was in a thrifty mood when surfing Amazon to find some new reading material for the break. So I checked out the free options in the Kindle store for science education books. Unfortunately there’s not much out there besides a few textbooks and Ontario school manuals, but one gem I discovered was Science and Education by Thomas Henry Huxley. To save you the trouble of checking Wikipedia: Huxley was an English biologist in the 19th century and is known for being a fierce advocate of Darwin’s theory of evolution, earning him the nickname “Darwin’s Bulldog”. He also coined the term “agnostic” to describe his views on the existence of God, and thanks in part to his efforts science became part of the British school curriculum. 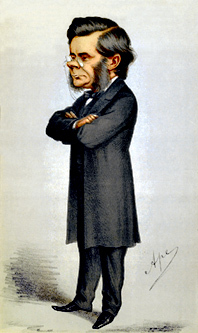 Putting aside the “savage” metaphor, Huxley makes clear that the method of scientific thinking is nothing extraordinary, it employs the same critical thinking and logic people use on an everyday basis, it is only the discipline and training through repeated use that makes scientific thinking so effective. In other words- scientific thinking is innate to all of us and can be taught to anyone. As an elementary science educator, is always surprising that even today there are those who don’t understand the appropriateness of science education for young children. So many people forget how utterly instinctive a child’s curiosity and urge to investigate is. A science education that taps into these instincts and develops them into knowledge and skills is obviously appropriate (and necessary) at any level. OK- so far so good Mr. Huxley, but what exactly should be taught? What do you 19th century guys know about standards and benchmark? Touche. Huxley goes on to describe an ideal scientific curriculum that begins in elementary with studying the phenomena of Nature (kind of like combined Earth and Life sciences) to deal with questions of the observable world. Then as students writing, reading, and mathematics skills improves with age he advocates for “physical sciences” to be introduced, including experimental physics and fields of biology such as botany, with a dash of chemistry and human physiology. Not too shabby. And what about pedagogy? Surely someone writing over 150 years ago had a very different perspective than our enlightened educational understanding today… right?? Thud! **Jaw hits the floor** This was the icing on the cake for me- Huxley, in 1869 mind you, is literally describing constructive learning theory and advocating for an inquiry-based approach to science education. And this is of course, before there even was such a thing as science education. It was even taught in schools yet, and Huxley himself was basically self-educated. Perhaps that’s why he could see the issue so clearly- his opinion was clouded by any educational traditions or assumptions. In fact the traditional education of the time consisted entirely of rote learning and memorization via books, so he was well aware of the limitations of this. It’s clear that Huxley was a man ahead of his time, but also the fact that his words resonate so well today underscores just how self-evident this approach to science education is. Yes, we have a body of educational research today that confirms best-practices, and we’ve invented a whole language of educational jargon to go along with it, but if the best approach to science education was obvious to someone 150 years ago, then it should be pretty freakin’ clear to us by now! So the next time someone starts waxing on about today’s educational reforms in inquiry-based science, you just tell ’em about Darwin’s bulldog, who figured it out before science education even existed. Over the holiday break I finally had a chance to read something that’s been sitting on my desktop for months: Lockhart’s Lament, an essay by the mathematician and teacher Paul Lockhart about the abysmal state of math education (he has also written a longer book version). If you haven’t read it, definitely check it out- it’s extremely thought-provoking and challenges a lot of assumptions about mathematics and education in general. In his essay, Lockhart makes a lot of sweeping claims that may sound downright sacrilegious out of context: Standards? Get rid of them! Lesson plans? Planning to fail! Schools of education? A “crock”! But there’s a method to his madness, he makes a very convincing argument by cutting right to the quick of the debate: the point of math education itself. Lockhart rejects outright the common assumptions that students need to learn the standard math canon for use in everyday life (when’s the last time you used your school math skills to do something that required more than a calculator? ), and he counters that advanced study should be relegated to the university level. In place of the standard math canon, he advocates for students learning by doing math as a mathematician would, puzzling things out for themselves and putting aside rote algorithms and standard notation for creative thinking and a sense of playfulness. Scientific literacy: One of the fundamental assumptions of most science educators is that scientific knowledge is important whether or not students go on to work in a scientific field. The idea is that all people should have a certain level of “scientific literacy” so they can make informed decisions on issues that require some scientific understanding (think global warming, genetically modified food, vaccines, etc.). Lockhart argues (for math) that the current standard curriculum isn’t really adapted to this kind of purpose in the first case, and if we were serious about teaching students something useful for every day life it would require major changes. On that last point I have to agree with him in science as well- while I make an effort as a science teacher to show students how the subjects were learning apply to their real life, this idea of usefulness is obviously not the driving force, it’s more of an afterthought. What gives? Should the curriculum be changed to reflect the true importance of the goal of scientific literacy, or is it just weaker secondary justification for science education? Interestingly enough, in a recent job interview I had for a Middle School science teacher position, a similar question came up: What’s the point of Middle School science education? I had already explained my belief that elementary science was all about establishing fundamental concepts and learning the skills of thinking like a scientist, and I had already conceded the truth that students don’t retain much factual knowledge from grade school anyway, so I had to stop and actually think during the interview (isn’t it funny how uncomfortable actual thinking on the spot is??). What I came down to was the idea that Middle School science would build on those elementary science fundamentals to teach students how science (and of course I also include in this the process of scientific thinking) really is useful and omnipresent in everyday life. After all, if every citizen had the equivalent of a good Middle School science understanding, we’d probably be in better shape than we are now, right? So I can’t concede dismissing the value of scientific literacy, but I do agree that the standard science canon needs some serious reshaping in order to truly provide students with useful understanding for their everyday lives. Instead of teaching the subject first and then looking for applications afterward, why not start with the useful context and have that lead us to the necessary science? This reminds me a lot of the way Dan Myer approaches math problems: starting with the real-life context, and then having students add math as needed. I think this same approach would be effective to entire units of study. I’m looking forward to digging into this next year in Middle School, so if you’ve got examples of this from your own teaching, I’d love to hear from you. Also looking for inspiration? Here’s a cool example of this kind of course for high school science.